Those who have been with us for many years know that we always give 110% to offer you the best web hosting service. We were among the first to offer free SSL certificates (thanks to our partnership with Let’s Encrypt), optimize network traffic to minimize latency via Noction IRP, protect against DDoS attacks (Arbor), and much more. In the past, we offered a variety of shared web hosting services, including reseller and e-commerce hosting. Back then, if you remember, server technology was quite limited. We were using SCSI hard disks. RAID controllers were rarely used and unreliable, and electricity consumption was massive. I won’t even get into the software (rarely used SSL/TLS encryption as vulnerable as Telnet, unreliable file systems, kernel panic, etc.). Today, it’s a whole other story. Everything is more powerful and miniaturized. SSL/TLS is part of our daily lives and the Internet is faster than ever. Thanks to many technological advancements and the work of PH R&D, we are now able to offer you a truly unique web hosting service. Instead of having only one web hosting account and putting all your eggs in one basket (server/account), why not take advantage of an infrastructure with hundreds of servers located in our certified facilities (datacentre, etc.) in France and Canada? Why not take control of your data and be free to create unique and unlimited web hosting accounts? This is exactly what we are offering, starting today. We have combined our World and Multi-World plans into one single product, entitled The World, and added an enormous amount of resources and features. Of course, the value for money is still unbeatable. Gone are the days when you had to order several web hosting plans and manage invoicing and technical support! You might want to create a web hosting account for a short period of time, make a staging environment, format your account, etc. However, a “new web hosting plan” often comes with a new 1-year contract and additional fees. PlanetHoster is offering you a brand-new, simpler, and more efficient concept. We are offering you a pool of resources (which has been considerably updated 🙂 ) and you decide how to distribute them. This means that with the above configuration, if you decide to distribute your pool of resources over as many accounts as possible, you can create eight independent web hosting accounts on two continents, in a certified datacenter (France or Canada), and in entirely independent infrastructures. And of course, each account can host as many sites as you want! However, we recommend one web hosting account per domain name for optimal isolation and outstanding performance. Managing everything from your PlanetHoster Client Area is simple and intuitive. In the next few weeks, all existing World and Multi-World accounts will be upgraded to The World. The transition will be 100% transparent and without additional fees. We will combine the resources from each shared hosting plan (World and other former plans) per client, upgrade them, and create a pool of resources specially designed for each client. You will then be able to create new web hosting accounts, adjust your resources, and much more. There will only be one all-inclusive shared web hosting plan => The World. You will regain control over all aspects of your web hosting account! We understand that a shared environment is not ideal for all situations. Sometimes you need a fully dedicated environment with administrator (root) access where you can customize everything according to your needs (specific versions of software, PCI DSS, e-commerce, etc.) and take advantage of PlanetHoster’s experienced technicians offering 24/7 management services. In addition to offering a fully dedicated environment, we ensure that resources are always available for use, no matter what time or day. PlanetHoster reserves the exact number of resources you need, unlike other shared web hosting plans in which resources are shared and usage depends on the overall burden of the infrastructure (not guaranteed). Reserving fully dedicated resources can be expensive. At PlanetHoster, we wanted to offer our dedicated clients more resources without charging additional fees. We came up with an idea -> Create a pool of resources that will be available to all our dedicated clients. Each client has their own fully dedicated resources plus 2.5x additional resources as needed. As the HybridCloud servers are fully managed, we can to detect any abnormality that may occur (high load, traffic peak, etc.). During an alert, your server will automatically receive a boost, for a maximum of 48 hours total (boosts are in 6-hour blocks, meaning you have 8 free boosts per month). We call this feature “AutoPeakPower (APP).” For more information: https://docs.planethoster.com/pages/viewpage.action?pageId=22872241. This feature is active on all HybridCloud servers as of today. 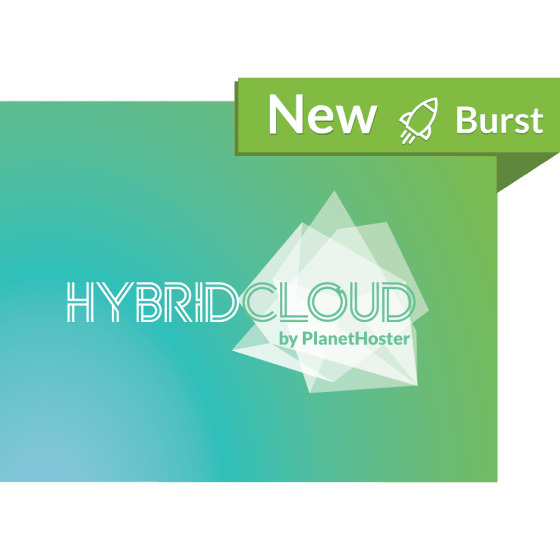 Furthermore, all HybridCloud servers will benefit from the Range (IP-Extension)—1,000 free IP addresses—as well as all other technological advances made by PlanetHoster (CMS Protection, anti-malware, etc.). In brief, we are dividing our products into two categories: shared and dedicated. World (Web Hosting Canada) is our all-inclusive shared platform: Multi-sites, 100% site isolation, single account + unlimited per site (+ unlimited domain names per account! 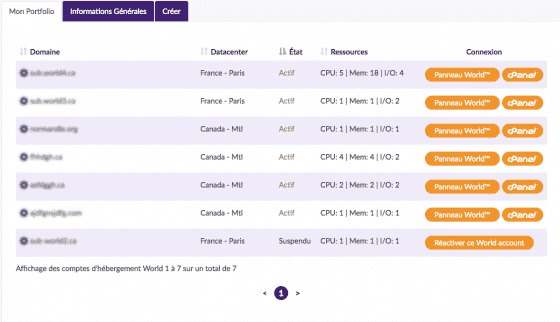 ), certified datacentre in France or Canada, etc. HybridCloud (Dedicated server Canada) is our dedicated platform: Fully dedicated environment, fully dedicated resources + 2.5x resources available, administrator (root) access, 24/7 managed services, 1,000 IPs available, installation of specific versions of software, etc. A webinar will be held this Tuesday (April 10) to walk you through the transition. You will have the chance to speak with our team (ask questions, make suggestions, give feedback, etc.). Thank you for choosing PlanetHoster! We look forward to serving you.